Internet culture has officially cracked into the typically dull pageantry that is the United States presidential election. The pun is clever and the picture is a smart way to sneak in some Bill and Chelsea. But above all, the amusing joke-out-of-an-error-message easter egg is Internet-culturally aware. Whether it’s the GIF-fied 404 from Bloomberg’s trendy new website, or the dinosaur mini-game that Chrome offers when a site can’t be loaded at all, the type of meta entertainment that your average Internet surfer expects out of brand or service sites has now become a part of being online. Survey the rest of the field of major presidential wannabes and you’ll find no other candidate having as much fun with his site’s 404 page. All the Republican e-headquarters offer either a standard “page not found” message, or take you back to the site home page or a standard site search. 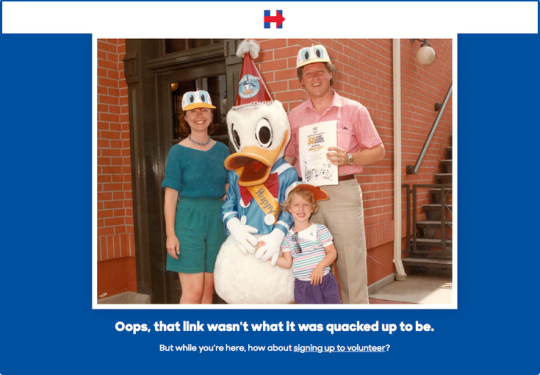 As more candidates from each of the main parties jump into this quickly intensifying race for the White House, we have to wonder whether campaign teams will take as much interest in Web fun as Hillary’s has. Just imagine the possibilities.